My summer romance with the Dairy Queen Blizzard - a stormy relationship, this is not! And on the forecast, no signs of this addiction ceasing. A few months in, it's now the time for experimentation. Straight ahead Blizzards with no featured guest stars -- so boring! Take my word for it...try the Chocolate X-treme Blizzard with Reese's Peanut Butter Cups swirled into the gooey mix. These choco-peanut gems raise this creamy treat to a whole new level of decadence, and fat grams, but who's counting?!? 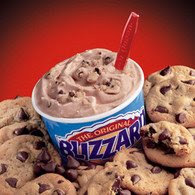 (btw, the Bliz photo on the left...the Cookie Dough Blizzard. Haven't tried that one yet -- but it's next on my to-do list).